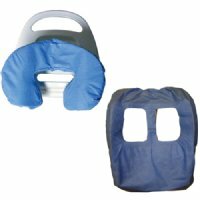 Use MRI breast coil covers to protect your equipment and patients from any oils, dirt, or contact skin issues. The breast coil drapes are compatible with models listed for each drape. Even though your model is not listed the coil drapes may still work. Also available is draping for MRI headrest coils and equipment. These medical drapes are used to protect both the patient and your equipment. The drapes are disposable for one time use. Sold in cases.